now 70% less crappy for users of internet explorer. After having ventured into the vastness of the abandoned pool in Williamsburg's McCarren Park with Nick on July 4th, I knew I had to go back at night. 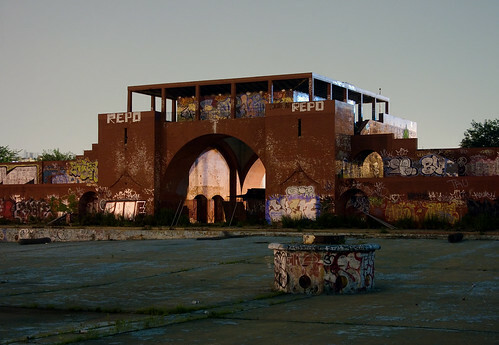 The crumbling pedestals and rusting metal, though perilous in low-light conditions, felt humiliated in daylight. I had gotten some nice responses to the daytime photos, but it wouldn't have felt right to stop there. I planned to sneak in at night during the next full moon, and gathered a couple accomplices to protect me from people with knives. The pool really feels more alive when it's dark. The shadows sharpen every angle, and you can hear every movement in the pool--footsteps, raccoons, pebbles. Because it's such a fortress, the space doesn't feel as menacing as, say, Roosevelt Island at night. It just feels forgotten there, as if all the kids moved away and the water gradually evaporated. They're repurposing the pool facility for some sort of short dance project in September, which could precede a larger redevelopment project, assuming funds and community support are there. As hot as it was shooting there last night, I have to wonder why they don't just make it a pool again. I'm David Yee. When I'm not trying to make rent, I take pictures, write, program, eat, and try to ignore the sounds of traffic and yapping dogs outside my Brooklyn apartment. Tangentialism, often, is my record of those activities. The Confluence Of The Modern Club Scene and "Breakin' 2: Electric Boogaloo"
I have been known to respond to pleasant notes and questions sent to tangentialism [at] gmail dot com. If you're feeling extra effusive, here's my Froogle Gift List.